Your choice of footwear is more important for the health of your back than you might think, so find out how to choose the best work boots for your job here. If you have an active job your feet can take a real pounding during the working day. As walking on hard concrete floors, climbing up and down ladders, and standing for long periods of time can all take a heavy toll. And the bad news is that active work isn't just hard on your feet. It can also cause you big problems in other areas of your body, such as your knees, ankles, and especially your lower back. And pain in these areas makes working so much harder​ than it should be. But how can you avoid this if your working life consists of long and grueling shifts where you need to be on your feet at all times? Well one way is by making sure you are wearing the right footwear for your job. Because this can give you the support, comfort, and pressure relief your body needs to stay healthy. And I'm going to show you the best work boots for men, depending on what your working day involves. 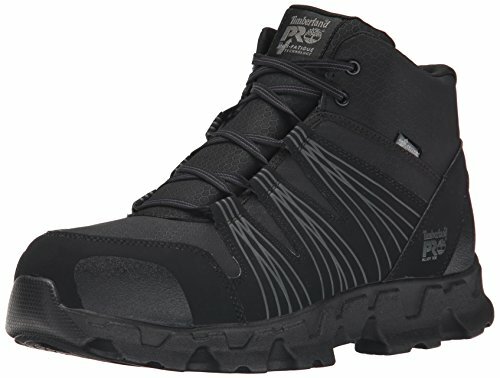 Best for walking on concrete floors - Timberland Pro Men's Endurance 6" PR Work Boot. 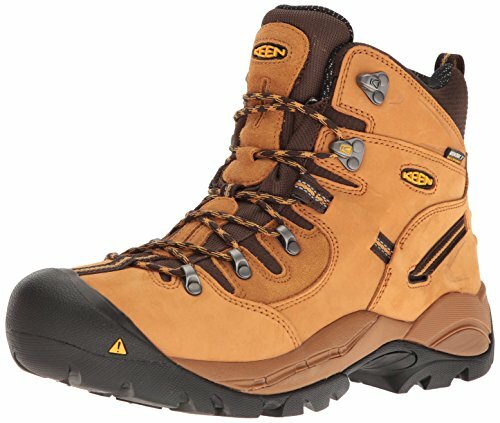 Best for climbing ladders - Timberland Pro Helix Safety Toe Work Boots. 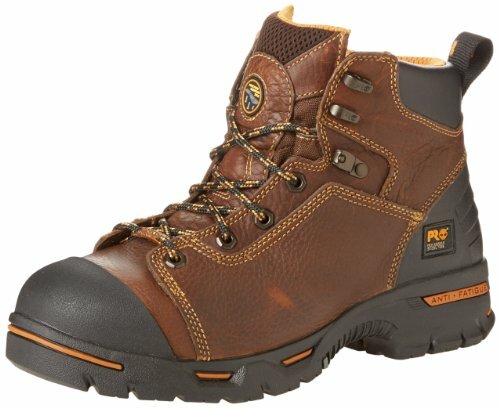 Best for standing - Timberland Pro Endurance Waterproof 6" Work Boot. 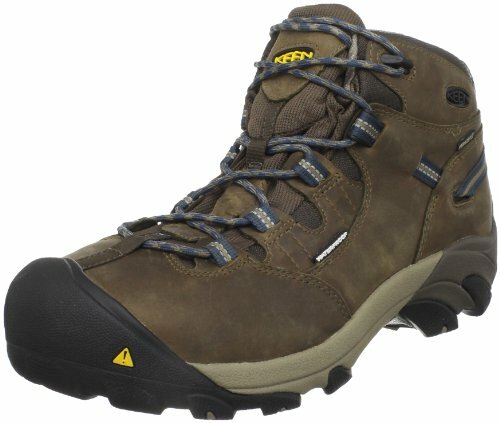 Best for digging - Keen Utility Men's Pittsburgh Steel Toe Work Boot. Best for lifting - Keen Utility Detroit Steel Toe Work Boots. 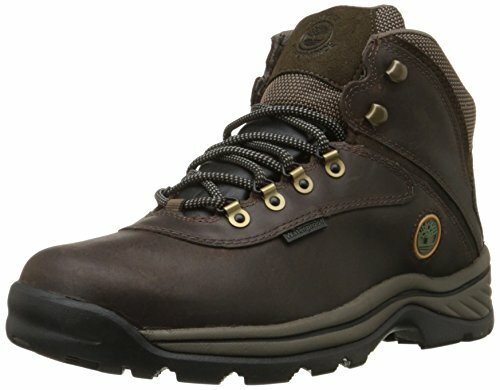 Best for driving - Timberland White Ledge Men's Waterproof Boot. Best for comfort - Timberland Pro Powertrain Work Boots. Why Is It So Important To Wear The Right Work Boots? Who knew good arch support could make you so happy? Now it may be hard at first to make the connection between your feet and your pain. But there are two main reasons why wearing the wrong type of footwear can cause you lower back pain. Boots that don't fit well cause you to walk with an unhealthy gait, which can lead to muscle imbalances forming and put your lower back under more pressure. A lack of arch support can throw your body out of alignment and fail to protect you from the shocks that walking on hard surfaces has on your body. And when you view the body as a whole you can start to see the link better. Because our bodies are all connected parts of the same machine, with each part needing to be working well to be able to function properly. So it's a bit like a car, where if one thing goes wrong everything else starts to go wrong too. This is especially true with movement, as each step you take affects how the rest of your body moves along with it. And if your boots don't fit you properly it will affect how you walk and stand. Which can throw your whole body out of alignment, cause you to adopt a bad posture, and leave your back under strain and in pain. And to return to the car analogy, your feet also act as shock absorbers for your body. So, when you wear boots that are lacking in arch support, each step causes impact pressure on your feet which resonates up throughout your whole body. Which jars and jolts your lower back and joints, causing your muscles to tighten and pain to arise. Buy boots that are comfortable and fit properly (in width as well as length). Get a pair that have good arch support. By following these two rules you are halfway towards a less painful day at work. But you also need to buy work boots that are best suited to the tasks you most commonly do in your job. As an active worker you probably have to spend plenty of time at work walking or standing on concrete floors. And the impact of walking on such a hard and unforgiving surface can be extremely bad for your joints, feet, and lower back. Especially when you are doing it all day, every day. So there is literally no give in it, and your body has to absorb the full impact of every step you take. And this doesn't just cause back, joint, and foot pain, it can also lead to cramps and fatigue in your legs. So to protect yourself from the effects from the concrete you need to wear work boots that have excellent support and can absorb these shocks to your joints. 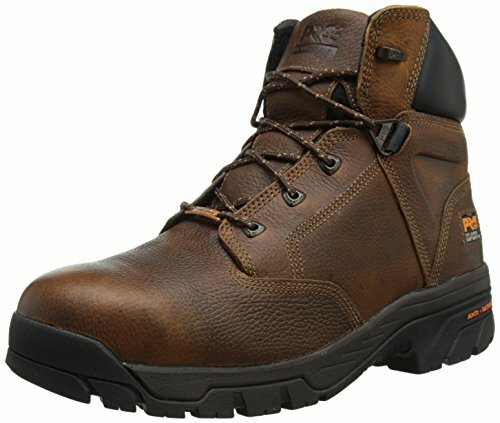 And a great pair for this task are the Timberland Pro Men's Endurance 6" PR Work Boot. These boots are built for endurance and are especially good for workers who spend long hours on their feet. They come with an anti-fatigue technology that absorbs shocks from the concrete, taking the pressure off your feet, joints, and back. Shock absorbing cones minimise the impact of the concrete, reducing foot fatigue and muscle cramps. The contoured insole gives extra support to pressure points in your heels and balls of your feet that come under the most stress from working on concrete. Some people have reported that the soles on these boots didn't last as long as they had hoped. If you are a tradesperson or a window cleaner, then climbing up and down ladders all day is an unavoidable part of the job. And while this can be fun, it can also be a cause of back and joint pain. Now I'm sure we all know that feeling of aching feet and limbs after a long day on the ladders. For me personally, I always sleep extra well when I'm painting exteriors. However, climbing ladders doesn't just leave you feeling tired, it can also lead to serious injuries if you're not careful. Because the long hours spent standing and balancing on the rungs can lead to back pain if you don't maintain a good posture or keep your core muscles strong. And climbing up and down them all day can wear out your knees and ankles if you don't have the right support. Also, with ladder work you are at risk of slips, falls, and accidents if you are wearing footwear without good grip. So, if you have to use a ladder regularly then you really need to invest in work boots for men that guard against these pitfalls. Which means a pair that offer great grip, arch support to absorb the shocks from climbing, and are comfortable and light enough to allow you to keep going all day. And the ones I'd recommend for you are the Timberland Pro Helix Safety Toe Work Boots. The support provided by the anti-fatigue technology helps to absorb shocks and keep your feet energised. The rubber outsole is slip resistant and provides excellent grip. These boots also come with a 'ladder lock' outsole radius, which offers extra grooves that make it easier and safer to climb the rungs. The lightweight construction means you are carrying less weight up and down, making climbing easier. They also have a breathable mesh lining to keep your feet cool, dry, and comfortable during a long day on the ladders. These boots tend to come up a bit narrow, so may not suit those with wider feet. Now it may seem that by standing around and doing less work your back should be under less stress and therefore be in less pain. But unfortunately for the lazy sods among us that just isn't the case. ​Because our bodies are designed to move. So when we stand in the same position for hours on end, pressure and strain builds and this pressure is transferred to our joints and muscles. Which leads to muscle fatigue in your lower limbs and means your back has to take on more of the strain while at the same time getting less support. In fact, if prolonged periods of standing are a part of your daily life it can be a cause of long-term lower back pain. Taking breaks every half an hour or so to move around and stretch your body. Shifting your weight from one foot to the other periodically to relieve tension. Making sure you maintain a good posture as you stand, and keeping your weight evenly distributed. Keeping your core muscles strong so your back has plenty of support throughout the day. And another good idea is to wear work boots for men that offer plenty of support and help to keep you balanced and comfortable as you stand. 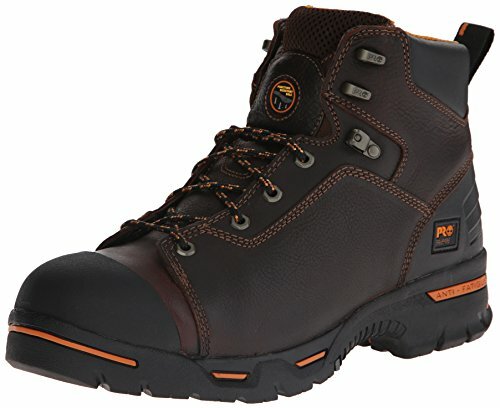 Which makes the Timberland Pro Endurance Waterproof 6" Work Boot a great purchase for those professional standers among you. As the 'endurance' part of the name suggests, these boots were made especially for workers who spend long hours on their feet. The cement construction of the boots makes for top comfort and flexibility. Comes with an 'anti-fatigue technology comfort system'. Basically shock absorbing pads that take the pressure off your joints as you stand. Has a contoured insole that gives extra support to the pressure points in your heels and balls of your feet. Did I mention they're comfortable?! Being made from cement construction rather than goodyear welt construction, they are not as endurable as other boots. However for standing that shouldn't be an issue. Not the widest boot, so may not suit those with wider than normal feet. A long day spent gardening, digging, and shoveling can be grueling work at the best of times. So the last thing you want to do is add back pain into the equation. Unfortunately back pain is a common occurrence for men and women of the shovel. But another way you can stay pain-free is by wearing the right footwear. Because when you are digging it's vital that you wear boots that are solid, waterproof, comfortable, and have a good grip. This allows you to remain balanced, and ​gain good purchase as you perform the powerful digging movements. Which takes the pressure and strain off your back and joints. They have a rubber outsole stretching right up over the toe that is oil and slip resistant. This gives these boots a great grip in all conditions. The waterproof uppers will keep your feet dry as you dig. They are tough but comfortable too, as the foot bed is designed to contour to your feet and support you as you work. The solid structure means that it may take a few days to break these boots in. But after that they will feel supremely comfortable to work in. Not taking care when lifting things at work is one of the biggest causes of back pain among active workers. So, if your job requires you to lift and carry heavy loads, first things first you need to make sure you are using safe lifting techniques to keep yourself fit and healthy. But at the same time what you wear on your feet can also go a long way in preventing any injuries. As work boots with good arch support take the strain off your joints and your lower back by absorbing the shock as you lift. And getting a pair with a good grip means you get better purchase during the lift and don't slip when carrying heavy loads. You also want a comfortable pair, as you are going to be on your feet all day. So, if lifting is a regular part of your working day I'd recommend you take a look at the Keen Utility Detroit Steel Toe Work Boots. The steel toe in these boots covers all your toes in case you drop something heavy on your foot! The foot bed design provides excellent arch support. They are comfortable and designed in a similar way to a hiking boot, making walking around in them easier. These boots are breathable and have a waterproof design, keeping your feet cool and dry. They are oil and slip resistant to help avoid any falls. They are also a lightweight and comfortable choice, so you can keep going all day. While great for factory work and lighter tasks, they are not durable enough for heavier construction site work. Driving all day for work can actually be one of the worst things you can do for your back. As not only do you have to deal with long periods of sitting, you are also exposed to whole body vibrations from your vehicle. And this combination can be deadly! So if you are a trucker, bus driver, or a delivery driver, you need to be aware of this and learn how to keep your back healthy while driving. And it's also vital that you wear the right footwear. Now I know that some of you may like to wear ​comfortable trainers for long days on the road. But while this is fine in the vehicle itself it can become a big problem at other times, as these trainers will be lacking in true support, protection, and grip. And these elements are crucial. Because a big part of your day may be spent loading or unloading heavy boxes and pallets, climbing up and down from your rig, or getting in and out of your vehicle. And you'll have to do this even in wet and icy conditions, which exposes you to a big risk of slips and accidents if you are wearing the wrong footwear. Comfortable to wear during the drive. Waterproof to keep your feet dry. Supportive enough to absorb the shocks from loading and unloading. Equipped with a great grip that is effective in any conditions and on any surface. And a pair that ticks all these boxes is the Timberland White Ledge Men's Waterproof Boot. Made with a soft, high quality, waterproof leather that will keep your feet dry. Has a rubber sole with multi-directional lugs, giving them a great grip on all surfaces. Rubber sole and lightness of the boots makes them easy to walk and climb up and down in. Breathable foot bed will keep your feet cool and dry as you drive. Comes with a "BSFP" support system (brake, support, flex, and propel) which helps to absorb the shock from lifting. Not really suitable for heavy use on site. For that you need something more sturdy and solid. If comfort is king for you, and your job doesn't involve as many heavy duties, then you can find some great boots to keep your feet happy throughout the day. And I must admit, I've always been fussy about what I put on my feet and can't stand wearing anything too stiff and bulky. As it just feels so much better when your feet are comfortable right? And let's face it, for plenty of active jobs you don't need the full bells and whistles in your work boots, such as steel toes, rigid construction, and high fits that can make them uncomfortable. So, if that's the case for you, then find a pair of boots that are soft toe, lighter, fit better, and allow your feet to relax and breathe. And you can still find comfortable work boots that are good for your back without totally sacrificing support and grip. With a great example being the Timberland Pro Powertrain Work Boots. These boots come with an alloy toe rather than steel, making them lighter and easier to move around in. The cement construction makes them flexible for added comfort. They also come with a 'comfort suspension system' which comprises of cushions and great arch support. They have a breathable mesh lining which allows your feet to stay cool, free of sweat, and comfortable. The anti-fatigue outsole keeps your feet supported and energised throughout the day. They feel more like trainers than work boots! Not suitable for heavier tasks on site. Might need a short period of breaking in, but they become super comfortable afterwards. Some guys are just really into feet. While getting suitable work boots with good arch support should help most people reduce their back pain, sometimes you may still need a bit more help. This is because there are various conditions related to your feet and legs that can ​also be a cause of lower back pain. And these may require the help of an expert to put right. Leg length inequality - having one leg longer than the other can cause muscle problems and imbalances that may require an orthotic shoe insert to correct. Bad posture - over-pronounced knees and ankles that face inwards or outwards as you stand and walk can put extra strain on your back and joints. Flat feet - these can be a cause of back pain and need special arch support in orthotic shoe inserts or boots to correct. So if you think you may be suffering from one of these issues yourself, it's a good idea to see a podiatrist. As these 'foot doctors' are specially trained to check your feet, arches, walking gait, and general alignment and will offer solutions to put right any problems they discover. These solutions range from orth​otic shoe inserts, custom-made boots, and adjusting your posture and walking habits. Which will all help you to maintain a natural alignment and keep your body balanced as you walk and stand. Leaving you with a healthier and happier back. I hope you now have an understanding of just how important it is to invest in a good pair of work boots. As long hours doing an active job can be grueling and wearing on your body. And for this reason back pain is extremely common among active workers. However by wearing work boots that fit well, offer good arch support, and suit the tasks you need to undertake, you can greatly increase your chances of staying pain-free at work. And you should be able to find work boots among the ones I've recommended that suit your needs. So let me know how you get on and if your new boots have made a difference for you.